Coincidentally Burdastyle, who incidentally have been running some sort of giveaway just about every week since the beginning of the year, have announced a tutorial competition and a chance to win a collection of Fiskars scissors. So I thought, why not! 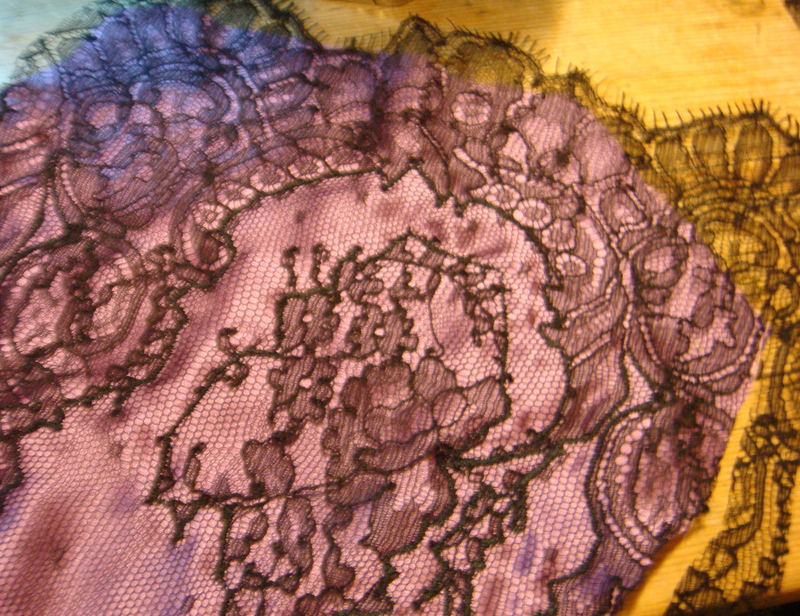 You can apply lace in many different ways but I am going to show how to applique embroidered lace onto a fabric. 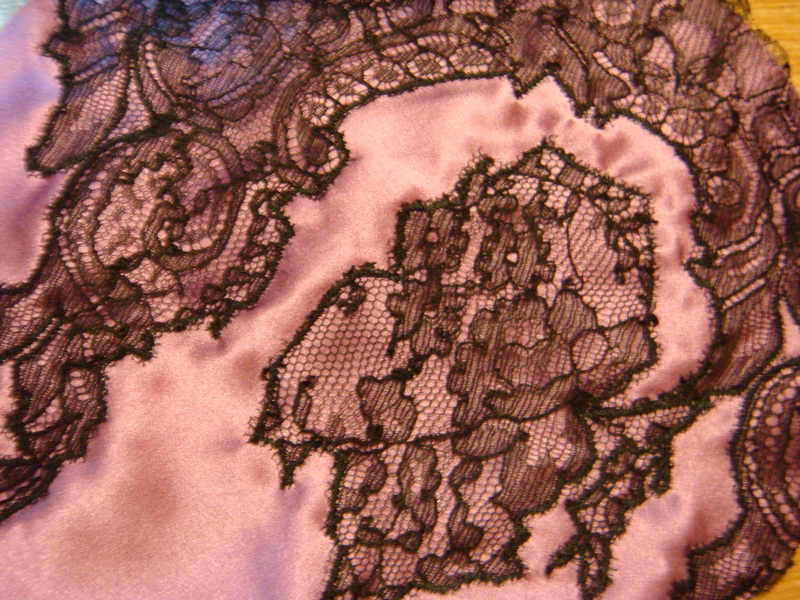 Here’s a picture of chantilly lace that I have appliqued onto the bust portion of a silk camisole that I am making. Step 1: Cut your fabric out according to whatever pattern you are using. Lingerie tends to be cut on the bias. 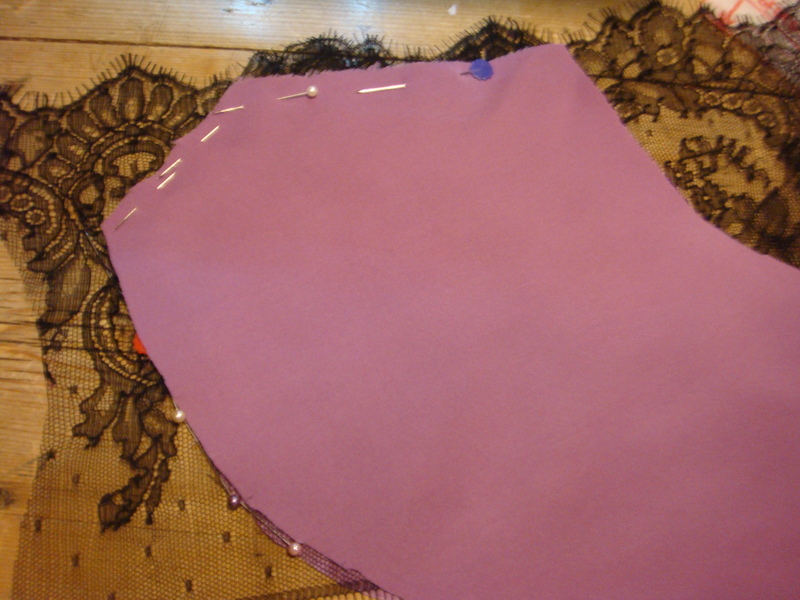 Step 2: Position your lace over the part of the fabric you want to attach it to. 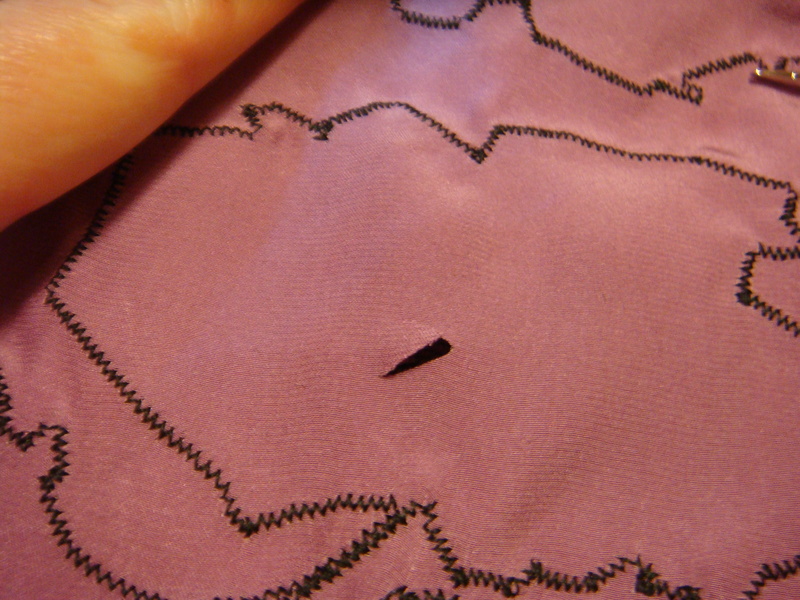 You can pin the lace into place but be careful to only pin it where you will be cutting it away. Step 3: You should try to use an open foot or a clear embroidery foot for this step, so you can see the line that you are following. But don’t worry if you don’t have one as it’s not impossible with a regular foot. Using a narrow and fairly close together zig zag stitch you want to stitch along the main lines or border in your lace. From the picture you can see that is not quite as close together as a satin stitch but it is fairly close together. If the border line is positioned in the centre of your foot, you use the zig zag stitch to stitch across the border and you are in fact only stitching either side of the border. It is a bit stop and start but that’s ok as you will be trying to move the lace underneath your sewing machine foot. 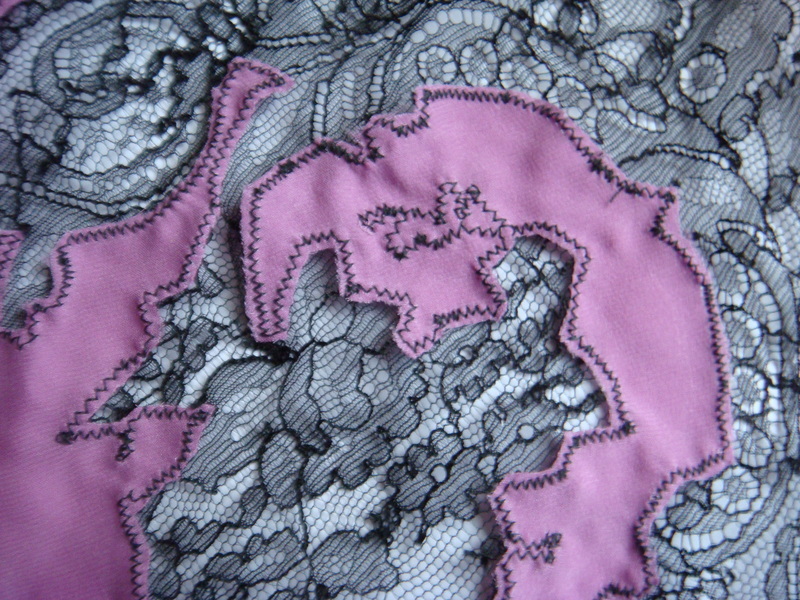 In order to change the direction that you are sewing in, remember to keep the needle in the down position and pivot to get round all the shapes in your lace. 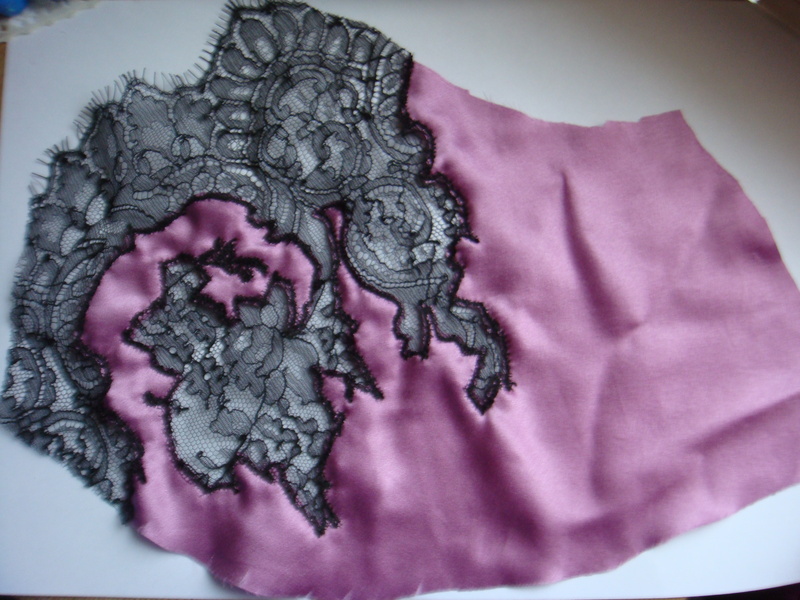 The thing to remember is that if your lace is particularly intricate, it will be too difficult to applique around every single shape and that you just have to follow the main lines. You may also find it easier to put the fabric and lace on top of some tracing paper or tear away stabiliser, especially if the fabric you are using is particularly fine. 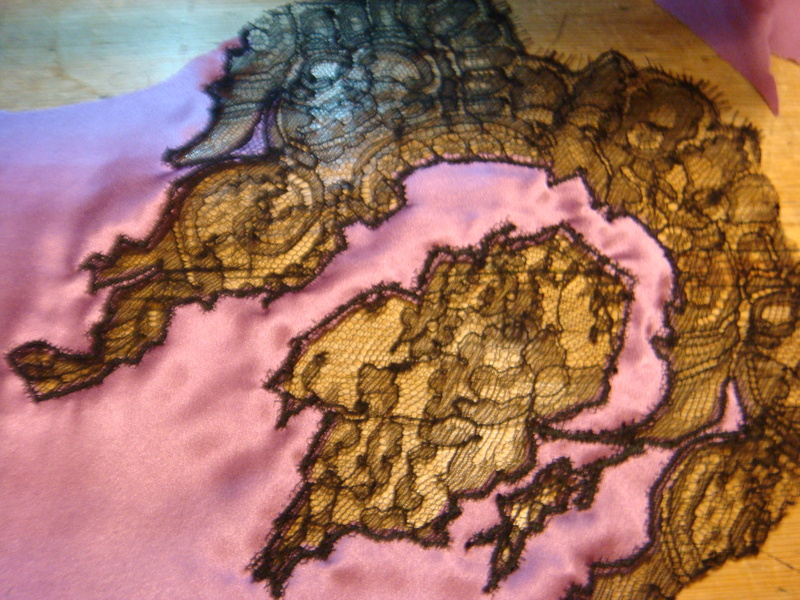 Step 4: After you have appliqued your way around the lace, here comes the fun part! Cutting away the lace! Step 5: Here’s where your embroidery scissors come in handy because they are so small and cut fine details – cut around the appliqued lace from the front. Cut as close as you can to your line of stitching. 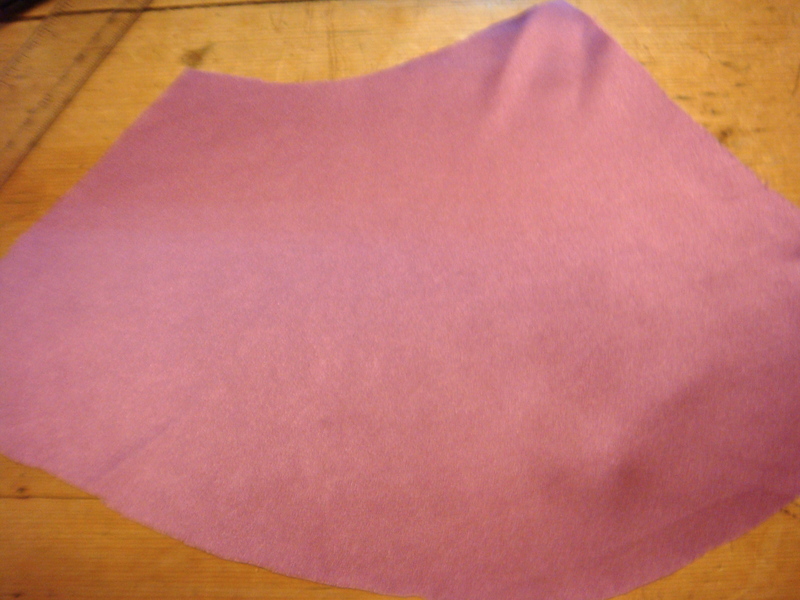 … And cut away the rest of the fabric on the back! Again, cut away as close to the line of stitching as you can. And because you cut the piece on the bias there will be limited fraying! And you should end up with something a lot like this! Awesome! Thanks so much for sharing. I have been looking for something like this for days. Amazing stuff! Thank you so much! I feel like no one has covered this anywhere over the internet.